Still undecided between Windows XP, Windows Vista or Windows 7? Actually, the choice is only between Windows XP and Windows 7, as those who wants Windows Vista will definitely prefer Windows 7. 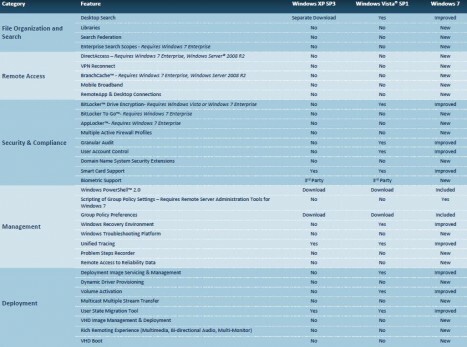 To let customers easily compare between Windows XP, Windows Vista and Windows 7, Microsoft has published a Windows Client Feature Comparison Chart, which compares features of interest to IT professionals across three versions of the Windows client operating system: Windows XP SP3, Windows Vista SP1, and Windows 7. The Windows Client Feature Comparison Chart of Windows XP SP3, Wndows Vista SP1 and Windows 7 is published on Microsoft Download Center, and the PDF file which is named Windows Client Feature Comparison.pdf can be directly downloaded here.